Pull one of the two durable chairs up to the child-size table-they're sized just right for kids, but strong enough to hold moms and dads, too! 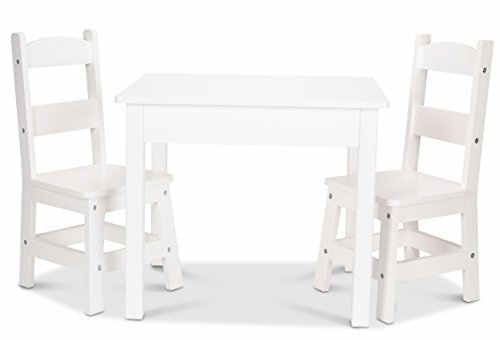 this sturdy wood table-and-chairs set comes in natural, white, or Espresso finish to fit with any home décor, and wipes clean to stay looking crisp and clean. The three wooden pieces are simple to construct with just a Philips-head screwdriver, and incredibly sturdy once assembled. Top the table with a child’s favorite puzzles or use it for arts and crafts, tea parties, puzzle play, lunch and snacks, and so much more! two chairs have an 11-in seat height and reinforced, tip-resistant design. Assemble with a Philips-head screwdriver, not included.